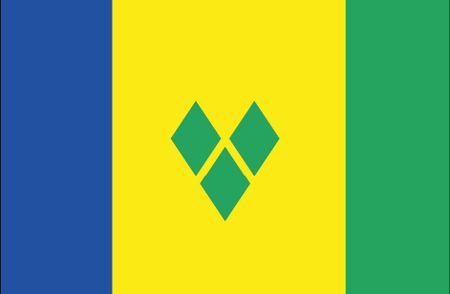 Saint Vincent and the Grenadines, sometimes known simply as St. Vincent, are some of the Lesser Antilles islands, occupying a position in the southern Caribbean among what are known as the Windward Islands. Somewhat confusingly, not all of the Grenadine islands belong to this nation's territory. Although the region was among the first in the West Atlantic to be visited by Europeans, the first permanent settlement was not established until the early 1700s, by the French. France and Britain each claimed the territory at various times, and both exploited the labor of enslaved peoples to work their sugar and tobacco plantations. The British eventually won out, and governed Saint Vincent and the Grenadines until the country claimed its independence in 1979. Bananas are one of the main crops here, but tourism is also a major part of the economy, having received a big boost from the filming of the Pirates of the Caribbean film franchises at various sites around the country. As a result of the influx of tourists, a fabulous course has been built on Canouan, one of the smaller islands south of St. Vincent. No less a designer than Tom Fazio was brought in to work his magic creating a full-sized championship layout that is among the best in the Caribbean. Each hole at the Grenadines Estate Golf Club is framed by breathtaking ocean vistas, making this a must-play for any golfer in the area.